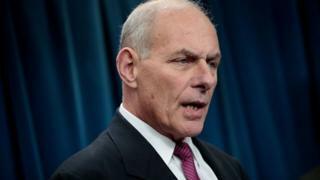 Image caption Gen Kelly described Confederate general Robert E Lee as "an honourable man" who "gave up his country to fight for his state"
President Trump's Chief of Staff General John Kelly has said an inability to compromise caused the American Civil War. Speaking to Fox News, Gen Kelly was discussing efforts to remove Confederate monuments and symbols. Confederate symbols have been a source of controversy in the US. 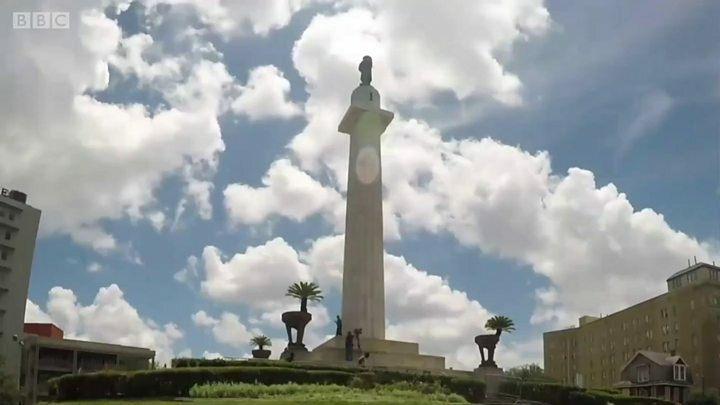 Some see them as an offensive reminder of America's history of slavery while others view their removal as an effort to suppress southern culture and history. Gen Kelly's remarks prompted a furious discussion on social media. Congresswoman Frederica Wilson, Chelsea Clinton and Bernice King, daughter of civil rights leader Martin Luther King, were among those to voice their opposition. Gen Kelly also described Confederate general Robert E Lee as "an honourable man" who "gave up his country to fight for his state". "There are certain things in history that were good, and other things that were not so good," he said. "The lack of an ability to compromise led to the Civil War. And men and women of good faith on both sides made their stand where their conscience has to make their stand." On Tuesday, White House spokeswoman Sarah Sanders rejected a reporter's suggestion that Gen Kelly's remarks could be seen as offensive and historically inaccurate. "Because you don't like history doesn't mean you can erase it and pretend that it didn't happen," Mrs Sanders said, accusing the media of inventing reports to create the impression of a "racially charged and divided White House". Award-winning black actor Wendell Pierce, who played characters on HBO's The Wire and Treme, wrote: "While they raped my Grandmother, lynched my Uncle, broke up my family to lost history, you find honor & compromise in that"? A distant descendent of Confederate General Robert E Lee, Reverend Rob E Lee, told the Washington Post that Mr Kelly "sees honour in a man who fought for continued enslavement of people and chattel slavery". Black historian Ta-Nehisi Coates, in a series of Twitter posts, described finding it "shocking that someone charged with defending their country, in some profound way, does not comprehend the country they claim to defend". The secession of southern states in 1860-61, and ensuing armed conflict until 1865, came after decades of growing animosity over the issue of slavery, and the election of Abraham Lincoln, who was explicit in his opposition to slavery, as President in 1860. Speaking to the BBC in May, three prominent historians of the American Civil War said there was a consensus that slavery was the key reason for the civil war. Jim Grossman, from the American Historical Association, told the BBC: "There are people who are not happy with that answer, who would like to see the Civil War as having been about something else." On social media, many pointed to earlier attempts to avoid conflict. Critics drew parallels between Gen Kelly's remarks and those made by President Trump in the wake of violence at a far right rally in Charlottesville in August. One woman was killed and several more injured when a white supremacist drove his car into a crowd of counter-protesters. President Trump sparked controversy at the time by blaming violence "on both sides" for the attack.